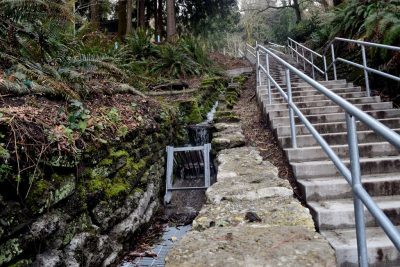 The Golden Gardens Drainage and Stairway Renovation project replaced popular yet unsafe and failing stairs with a new ADA-complaint 6 ft. wide concrete stairway in Golden Gardens Park, located along the Puget Sound in Ballard. 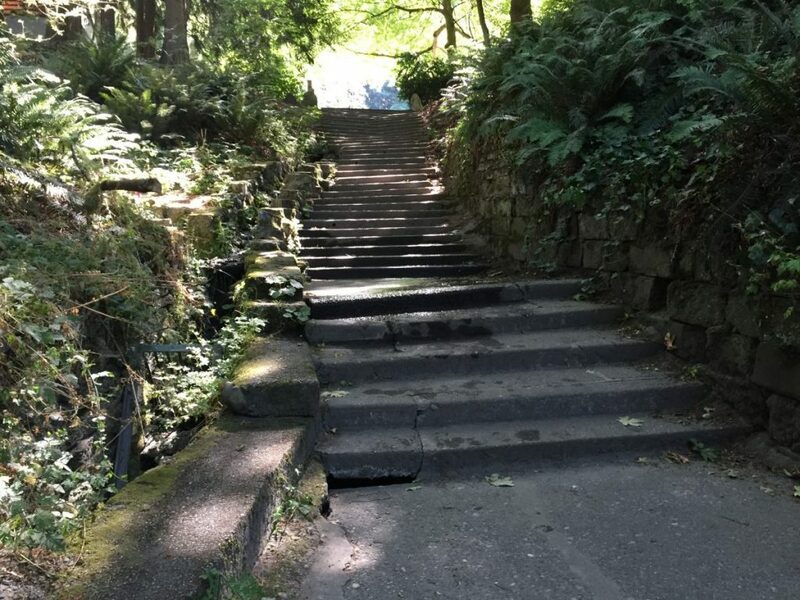 Developed in the early 20th century, the park has since become a Seattle landmark, known for its historic stairway connecting the beach to an off-leash dog park and neighborhoods. 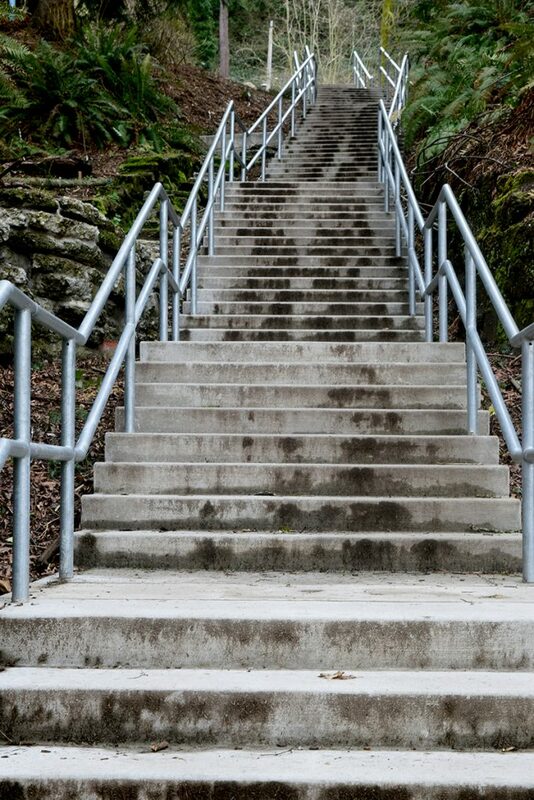 The previous drainage system under the steep, non-ADA compliant stairway consisted of a stacked-concrete slab channel, which turned into an open concrete channel adjacent to the lower stairs. This drainage system supported storm flows and a steady base flow year around and was leaking due to gaps between the stacked-concrete slabs, allowing groundwater to wash the fine sand out from beneath the existing steps, causing the steps to unevenly settle and crack. 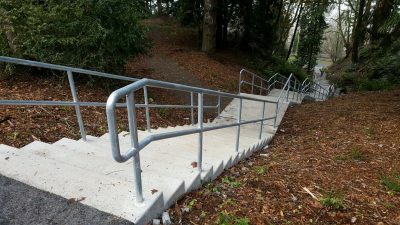 This failure of the stairs and drainage infrastructure created serious safety concerns for park visitors who used the stairs. 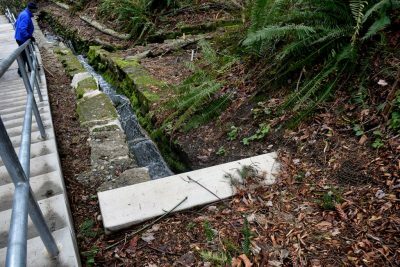 The improved closed drainage and underdrain system captures and redirects surface and subsurface flows to reduce subgrade settling and re-occurrence of erosion problems which had caused the original failure. The cracks were sealed in the lower open channel, popular with visiting school groups and children. As Vice President of Engineering and Senior Project Manager, Laura provides specialized hydrologic and hydraulic engineering, modeling, and design on Osborn Consulting projects. 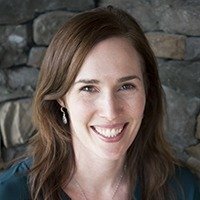 Laura’s professional engineering experience and background includes hydrologic and hydraulic modeling, flood reduction studies, stormwater management plans, small drainage projects and providing field direction during the placement of large woody debris. 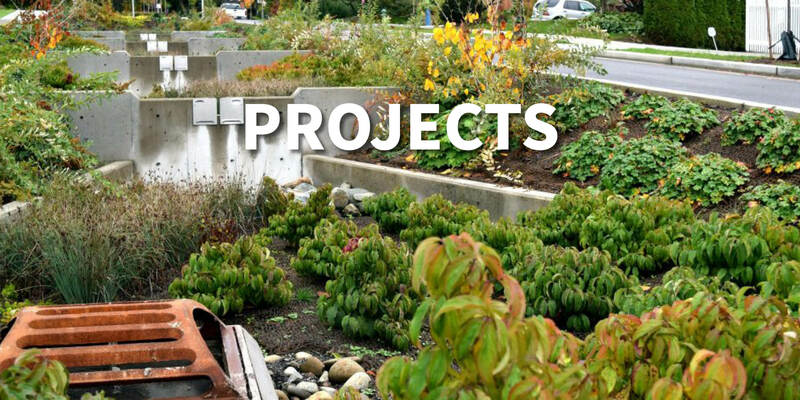 Her technical expertise also includes stormwater master planning, preparation of construction documents (PS&E), and capital improvement plan development. Laura is organized with a strong attention to detail. Laura likes to get out and move. She loves the rush of running races and doing CrossFit, as well as the more relaxed pace of walking the dog, working in the garden, and tending to the chickens.